St. Mary’s is about tradition, values and community. Take a moment to explore online, or visit campus and see for yourself why our students love the University, the people and the atmosphere. 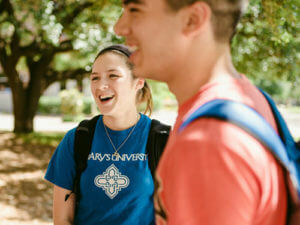 Visiting St. Mary’s is one of the best ways to get a feel for the campus and determine if it’s the right school for you. Schedule in advance and an admission counselor can guide you through the facilities and introduce you to students and faculty. Are you ready to join our community of nearly 4,000 learners? Taking the next step couldn’t be easier.